Along the dry, rocky desert of El Paso, Texas–past all the food chains and shopping malls–a brown fence stretches for miles. The fence marks the southern U.S. border that separates El Paso from its Mexican sister city, Juarez. Antonio Villaseñor-Baca is 22-years-old and was born and raised in El Paso. His hometown is a huge “borderplex” that spans the Rio Grande River. Antonio has an uncle in Juarez, and while growing up, his dad would take him back and forth a lot. To Antonio, Juarez doesn’t seem like another country. “If you wanna go out and party, you go to Juarez. A lot of people work in El Paso. You have family in Juarez, but you live in El Paso, or vice versa. It really seems like just a huge hassle to go through all of this stuff at the border,” Antonio said. 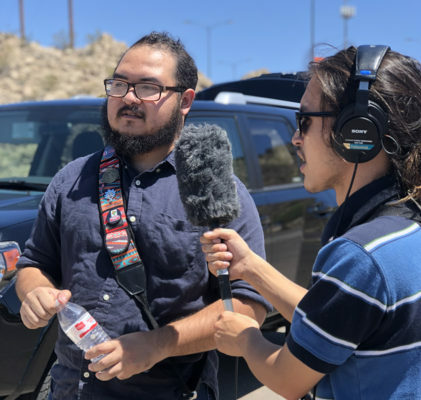 Youth Radio reporter Billy Cruz [right]interviews Antonio Villaseñor-Baca in a parking lot on Sun Bowl Drive that overlooks the US-Mexico border. Photo: Denise Tejada/Youth Radio. For young people like Antonio, life on the border isn’t just about the momentous crossings we read about in the news. Commuting between two countries is a part of everyday life. There are even kids with dual citizenship who live in Juarez with their parents and cross the border to go to school. “It’s really weird, because growing up as a kid, they are just other kids in your school. You don’t really tend to label them or divide. And it’s not until you get older that you start seeing, it’s the kids who speak Spanish who are doing the daily commute. And it’s when the terms like American and Mexican and Mexican Americans start coming into place,” Antonio said. 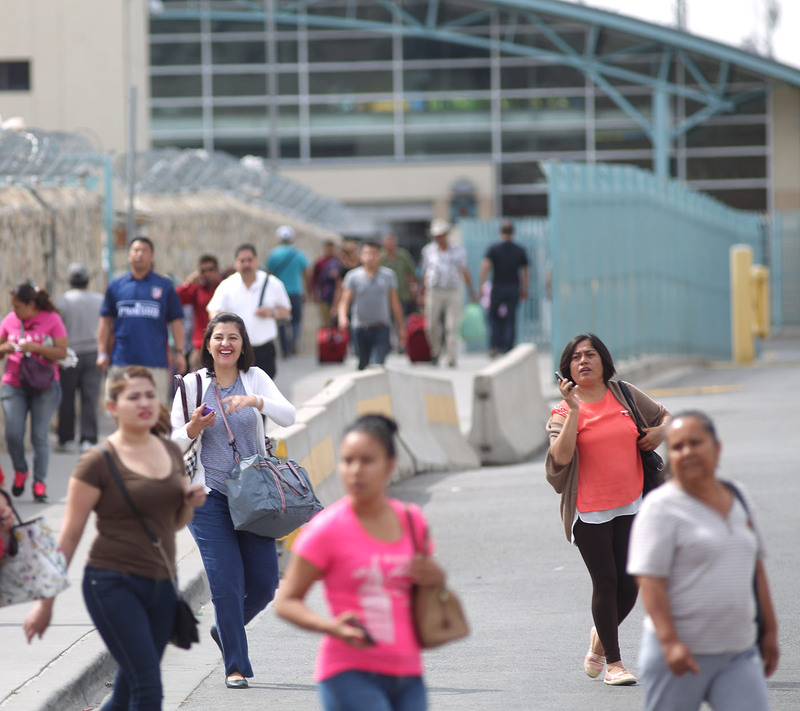 Everyday, people and goods flow between El Paso and Juarez. The culture and economies of both cities rely on each other. Kenia Guerrero, 23, is a part of that flow. She grew up in Juarez but just finished college in El Paso, and she crosses the border every day to help out at her parents’ cowboy boot shop. She commutes via the Santa Fe Bridge, which leads to the central part of El Paso. Depending on the line on any given day, she says the trip from Juarez to El Paso can take from 30 minutes to three hours. 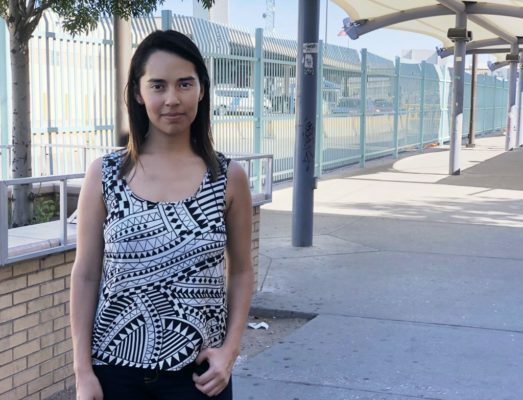 To ease her commute between the two cities, Kenia purchased a SENTRI (Secure Electronic Network for Travelers Rapid Inspection) pass, which allows her to drive in an express lane that cuts down the time it takes for her to cross the border. Thousands of people in the El Paso/Juarez region pay fees and go through background checks to obtain a SENTRI card. Kenia says she feels equally at home in Juarez and El Paso. Kenia Guerrero, 23, stands on the El Paso side of the Santa Fe Street Bridge — a port of entry into the United States from Mexico. Kenia is from Juarez, just across the border, but says she commutes daily to El Paso. Photo: Denise Tejada/Youth Radio. “For my first 15 years, I didn’t know about borders. I live in Juarez, but I would buy my clothes and certain foods [in El Paso]. It was pretty normal,” Kenia said. Now, Kenia is extra careful whenever she crosses, because she says agents have gotten stricter, since President Trump took office. If she’s caught with a prohibited item–like even an apple she packed for lunch and forgot to throw away–Kenia could lose her fast-pass. Recently, she had a close call. “I had a crushed candy in my cup-holder, and the agent asked me: ‘Is that cocaine?’ I got nervous, not because it was cocaine, but because it’s just the question, how can he think I’m bringing cocaine? And I just told him something along the lines of, ‘No, but if you want to try it, you can,’” Kenia said. The agent passed on the candy and eventually let her cross. As security and media attention at the border increases, Kenia and Antonio are trying to hold onto their sense of hometown normalcy. “Yeah it’s a border and anywhere else in the country will see it as such. But for us, it’s just two cities, divided by a fence,” Antonio said. For the time being at least, Antonio and Kenia will keep crossing that fence. Because for the people who live and work here, these two cities–El Paso and Juarez–really do feel do like one.